Debbie Johnson is a Florida watercolor artist. She teaches classes and workshops and is represented by galleries in Florida and Michigan. For I know the plans I have for you,” declares the LORD, “plans to prosper you and not to harm you, plans to give you hope and a future. 12 Then you will call on me and come and pray to me, and I will listen to you. 13 You will seek me and find me when you seek me with all your heart. 14 I will be found by you,” declares the LORD, “and will bring you back from captivity. I want to heighten the white of the plate, so I added a pale, very wet wash of cool French Ultramarine Blue to the table and the shadow under the plate. 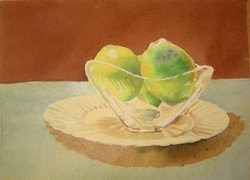 This wash will also slightly soften the edges of the plate shadow and bring the focus back up to the fruit, which is the focal point.